Marble Collection White w/Silver Marble Swirl Square Charger Plates, 10ct. 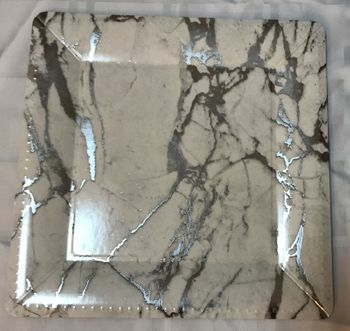 Marble Collection White w/Silver Marble Swirl Square 10.5" Dinner Plates, 18ct. Marble Collection White w/Silver Marble Swirl Square 7.5" Salad Plates, 18ct. Marble Collection White w/Silver Marble Swirl Hexagon 10.5" Dinner Plates, 18ct. Marble Collection White w/Silver Marble Swirl Hexagon 7.5" Salad Plates, 18ct. Marble Collection White w/Silver Marble Swirl 16" Platters, 3ct.